For protection against cold weather, Army Nurses received different types of overcoats to wear with their service uniforms. A blue overcoat was issued in conjunction with the blue service uniform. The overcoat was made of dark blue covert wool and was equipped with a removable liner.
. Overcoat, Field, Women's, Officers' . 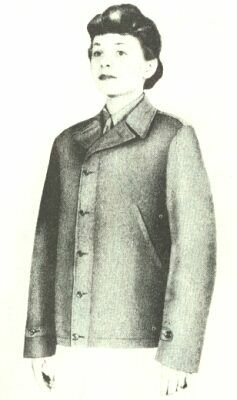 After the Army had introduced the olive drab service uniforms for nurses, an olive drab field overcoat made of cotton poplin was issued to be worn with these new service uniforms. 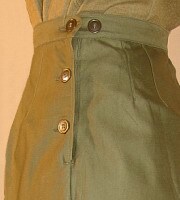 The buttoned-in wool liner had a rayon shoulder lining and binding around all edges. It was designed for use also as a dressing gown.
. Overcoat, Wool, Women's, Officers' . 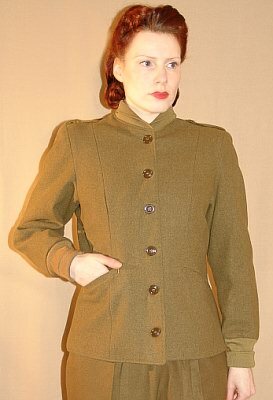 The heavy weight double breasted overcoat introduced in late 1944 was cut exactly like the enlisted WAC women's, but equipped with shoulder loops. 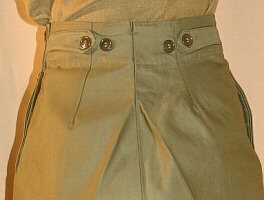 The inverted box-pleat in the middle of the back was held by a half belt with two buttons. It had two slash pockets, a convertible collar and storm tab. .. For rainy weather, Army nurses received a raincoat. 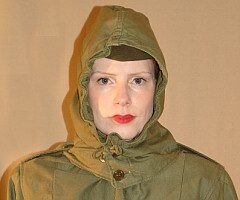 The parka-type raincoat was made of coated fabric. It had a straight cut and 5 button front with inside storm fly. The material prevented air circulation. Therefore, the coat was equipped with a couple of holes below the armpit and ventilated on the outside with a shoulder yoke across the back. Nevertheless, perspiration was collected inside when the coat was closed.
. For wear over their hospital uniforms, Army Nurses were issued wool capes. At first, the wool capes were blue with maroon colored piping. After the introduction of the olive-drab service uniform, an olive-drab cape was provided. . The dark blue, wool covert cape with maroon wool lining has a high neck collar with button closure ..
. The olive-drab wool barathea cape of double fabric should give warmth and drape. The collar was buttoned with tab closure. 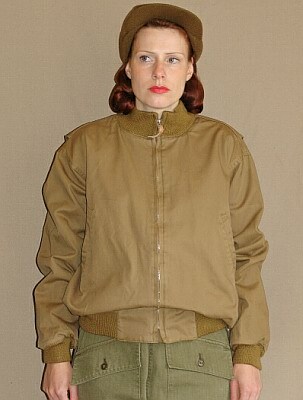 Initially, there were no special field jackets for women who had to wear men's clothes as substitute. Two of the first Army Nurses to land at Normandy wearing the men's winter combat jacket. 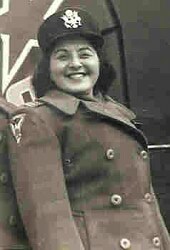 Additionally, Army nurses were issued a short, combat jacket of windproof, water repellent cotton poplin with flannel lining and with button and zipper closure. It was the same jacket issued to men as M-1941 Field Jacket. Since the M-1941 jacket had proved unsatisfactory under field conditions, a new model of field jacket was designed. 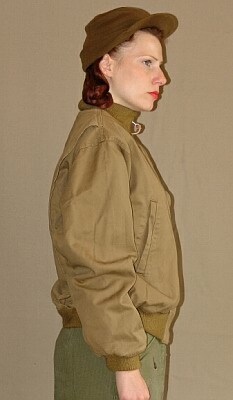 This M-1943 jacket was procured in a female version that was similar in its general features to the M-1943 jacket issued to men. Jacket, Field, M-1943, Women . made of same material as the jacket. It was designed for wear over the head with or without the wool knitted cap or the M-1 steel helmet. 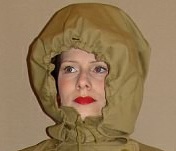 The hood was small enough to fit in the pocket of the jacket when it was not used. The jacket was worn as a liner in conjunction with the M-1943 field jacket for extra warmth. It was also suitable for wear over the sweater and the wool waist. Equipped with knitted rib collar and sleeve cuffs, button front closure and slit pockets. made of wind resistant, water repellent cotton fabric. They were worn over the wool liner for fieldwork and outdoor wear in cold climates. 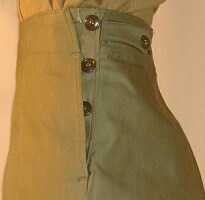 The trousers had adjustable button closing on back of waistband and on the left side. Tapered leg closure for close fit under overshoes and leggings. The pattern was introduced in July 1943. .
made of wool. It has knitted rib cuffs at the ankle and a button closure on the right side. Probably, the liners had the closure on the opposite site than the outer cover trousers for better protection against wind and cold. With the different closures, both hips were protected by complete covering on each side. Additionally, the different closures prevented bulkiness on one hip side caused by two button closures on the same side.
. 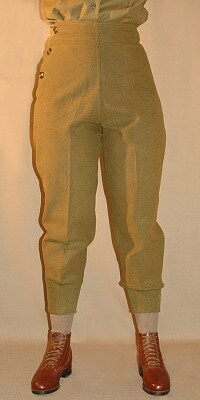 In the end of 1944, revised outer-cover trousers and wool liners were introduced. 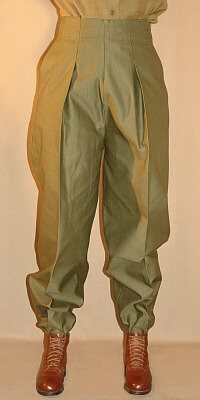 The ski trousers pattern was converted to a slacks pattern. 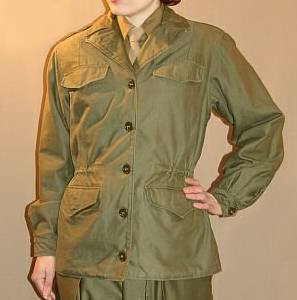 The authorization of the revised outer cover and liner trousers came too late in the war to have any further effect for the female Army personnel during the war. Unlike the previous version, the outer cover trouser had straight cut legs and rear buttons on waistband for adjustable closure.
. The new pattern without knitted rib cuffs and straight cut legs could be worn alone or under the outer cover trousers for extra warmth. Like on the first version, the button closure was on the right side. 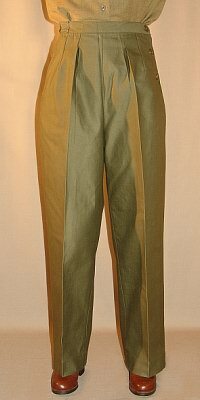 On the photo, the liner wool trousers are worn with the olive drab wool shirtwaist and necktie . .. 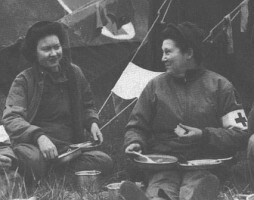 In WWII pictures, one can see Army Nurses serving overseas wearing the following combination of cold-weather garments and personnel equipment presented in the picture on the left side. M-1 steel helmet, M-1943 field jacket, outer cover trousers, leggings and WAC field shoes. Additional personal equipment included a canvas field bag held with M-1936 suspenders, M-1936 pistol belt, canteen, first aid pouch and gas-mask carrier.